It can be tough being the new kid on the food writing block (NKOTFWB album dropping soon! ), and perhaps even more so when you’re trying a storied, popular restaurant for the first time. 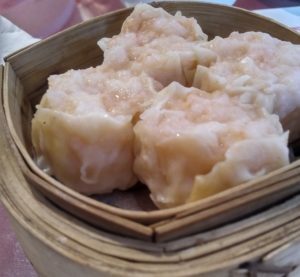 Many meals have been had there, and much ink has already been spilled about dim sum-specialized Hung Sum, so why do I need to throw my two cents in? The same reason I blog about any place: I’m selfish and I enjoy attention. While my dad was in town, we had to go out for Chinese, and I came across Hung Sum through my digital researching. They are frequently (here and here) touted as the best dim sum in the city, and after a hiatus they re-opened late last summer at a new location at the western edge of Chinatown. I’d cite my sources, but I’ll just let you Google the info for yourself if you don’t believe me. A common complaint, and perhaps the root of the only complaints about Hung Sum is that they get busy. Very, very busy. They’re a victim of their own success and from cooking their dim sum to order instead of rolling it around on cart until its gone. Luckily for us, we were going on a weekday evening, and for an early meal since kids were coming. As such, I can confirm that 5:30 on a Thursday is prime time to get dim sum without excessive waits. The menu is broken up into dim sum categories of small ($3.75) to extra large ($5.65), as well as a section of chef’s specials which are more entrée-esque. We were five adults and two small kids, so we ordered a lot of food. Too much, some would say (basically everyone at the table but me). 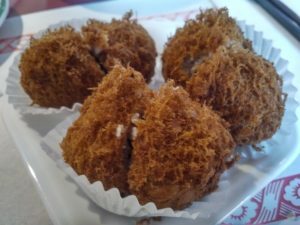 New-to-me items like deep fried taro balls with pork, and egg yolk buns caught my eye, and we also got several types of dumplings – pork and shrimp shiu mai, chiu chow-style pork, coriander shrimp, shrimp har gow, and ginger beef. Oh, and also spring rolls, black bean spare ribs, chicken feet, Chinese broccoli with garlic, and chicken with Chinese sausage on rice. So you could say we were pretty set. The food came out in a steady stream, and our waitress was super friendly and a total pro; her attentive service included water and tea top ups, and empty steamer baskets being taken away promptly to make room for more food. 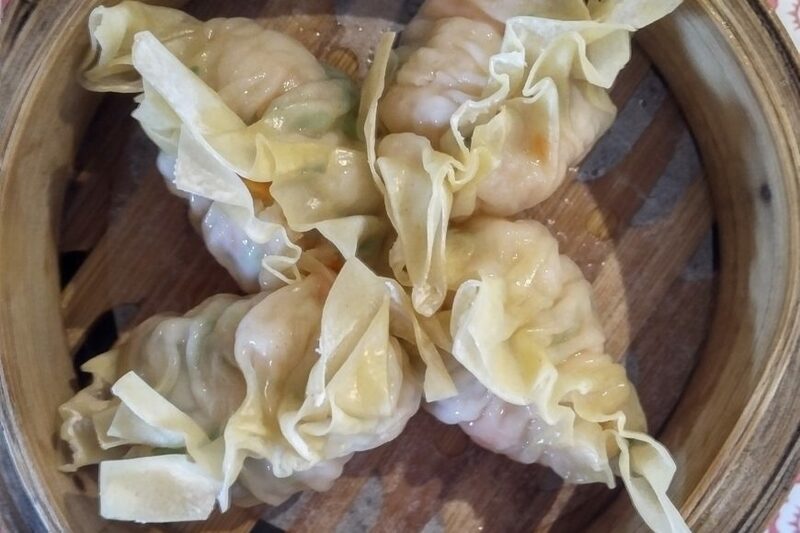 The dumplings were all excellently executed – varying textures with different styles of wrappers, moist and tender meat (nothing over-cooked), and great flavours. A consistent favourite around the table seemed to be the ginger beef dumplings, with their slightly crisp wrappers and really well-balanced flavours. Ginger is often used with too heavy a hand, but not here. 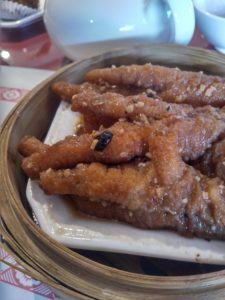 I very much enjoyed the taro balls, with their wonderfully crisp, lattice-like exterior, and the chicken feet were a tasty, if quite boney, throwback to my trip to China a decade ago. The spare ribs and Chinese broccoli were also spot on for doneness, and the broccoli provided a much-needed splash of green amongst a sea of carbs and meat. 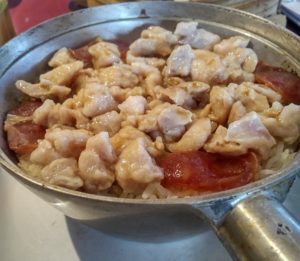 The chicken with Chinese sausage and rice came out in a scorching-hot pan, which made for nice, crisp chunks of rice on the outer edge. My only complaint during the meal was about the spring rolls, which had a soggy filling-to-wrapper interface. But, considering the volume of food that we tried, the overall experience was overwhelmingly positive. Chicken and Chinese sausage with rice. That pot was hot! We’re not stopping there folks. After all of this, there was only one option: dessert! The egg yolk buns were an obvious choice, and we also tacked on an order of the deep-fried dough sticks, which our server informed us one order would suffice for everyone. The egg yolk buns were just as popular as the ginger beef dumplings, which was all the more impressive considering how much food was already in our stomachs. Their egg custard filling was sweet and rich, with just a hint of tartness – a perfect finish to the meal. Well, almost the finish. 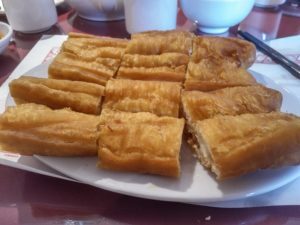 The Chinese doughnuts sticks gave us a plateful of goodness – flaky on the outside, airy and slightly doughy on the inside, and since it was plain fried dough, these even went over well with the kids. For a paltry $2.50, this was a big win. I had to cut and run to catch the bus before the bill came (smooth, I know), so I don’t know the final tally, but with some rough mental math it would have been around $100 before tax and tip – shockingly little for seven people, and a ton of fantastic food. So yeah, I’m just another voice added to the choir of people singing the praises of Hung Sum. But when not all of my meals are nearly this good, I’ll relish both the food and the chance to tell people about it. Skip the cookie cutter, family restaurant chain, and come here. It’s cheaper, it’s better, and you’ll likely get to try something new.